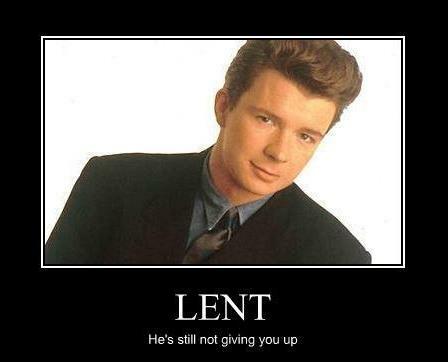 Could you give up Rickrolling for Lent? The original version of this post from February of 2012 first appeared on the Roads From Emmaus weblog. It is also available as an audio recording at Ancient Faith Radio. That such a piece would be posted on the Christianity Today site is certainly a sign of the times. Lent itself has been religio non grata for Evangelicals’ low-church Protestantism descended from the Radical Reformation for quite a long time. I’ve been surprised in recent years to hear of Evangelicals recovering the idea of Lent, and here we have an example of someone from that tradition reflecting critically on that appropriation. Or do we? CT is certainly an Evangelical publication, but who is Mark Galli, and why does he construct his argument in the way he does? We’ll get to that, but let’s first look at the argument itself and how I as an Orthodox Christian would evaluate it. The narrative here has a classic rhetorical shape: Appear to be criticizing or dismissing something, then reveal how you’re not really criticizing it, but instead revealing its true message contra the popular impression of that thing. Thus, Galli seems to be dismissing Lent (“the Grinch that stole Lent”) initially, but he eventually says that its true value is something else. How does this actually work out in the article? What he is indeed criticizing is that Lent really is about self-discipline. Self-discipline as an inherent good is part of the Pietist package, and it makes sense to approach Lent from that angle (if one approaches it at all) from within Evangelicalism. Modern Evangelicalism is so steeped in the culture of self-improvement and self-help (not to mention, self-service) that Lent actually starts looking pretty good, so long as it’s understood in this Pietist manner. Because there is no doctrine of theosis (divinization/deification, the process of becoming united with God in His divine energies) in the world of Pietism—nor really in any of the Reformation churches—asceticism has nothing to do with uniting with God. For us who believe in theosis, asceticism’s very purpose is the retraining of the will, not for the sake of mere self-discipline, but rather because the will has to become receptive to divine grace in order to receive it. But that doesn’t exist outside of theosis, so fasting or giving up anything at all for Lent will not, as Galli says, actually lead to more self-discipline. That wasn’t its purpose when it was commanded by Christ, so attempting to use it for that won’t actually accomplish it. Asceticism’s purpose is the retraining of the will, not the self-improvement of the body. Fasting is not a diet to help us lose weight or to become more “responsible.” It is the ongoing struggle against the passions. What’s also missing from Pietistic asceticism is the guidance of tradition and community. Remember that Pietism’s concern is the private relationship with God, so there is little room for the idea that one should have a father-confessor guiding one’s asceticism, who is himself guided by centuries of Church tradition and experience. It’s something you do on your own and for yourself. So why shouldn’t you just pick and choose for yourself how you’re going to do it? Here’s the one invaluable thing that Lent teaches: Yes, Martha, you are the undisciplined, self-centered human being you suspected you were. Yes, Frank, you are in many respects a miserable excuse for a human being. Yes, we are sinners, and sinners without hope. When it comes to the really important things—like learning to have faith, hope, and love—we can’t do a blessed thing to improve ourselves. These come as gifts or they don’t come at all. To me, participating in a Lenten discipline is my chance to do a little play acting. What would it be like to live as if the law were in fact sufficient? How about for 40 days I pretend that I really can improve myself in the sight of God? Let’s see how that works for me. What I find Lent after Lent after Lent is that Lent is a miserable way to live! This is one reason we’re so glad when Lent is over! If Lent were such a great idea, if it really did make us better Christians, you’d think we’d want to turn Lent into a lifestyle. But no, we don’t want to do that precisely because Lent is an onerous form of existence. It’s the life of duty. Life under law. Life as a death march. So here we have to figure out exactly from where within the Reformation Galli is making his criticisms of the Pietistic approach to Lent. To figure that out, I had to do a little digging. Galli is of course one of the editors at CT, but some Googling reveals that he is also a member of the Church of the Resurrection in the Wheaton, Illinois, area. And to whom do they belong? That also took some digging. (What is it with churches that don’t tell you up front which denomination they’re part of?) They belong to the Anglican Mission in America, a conservative breakaway from the Episcopal Church USA (which has as a body gone quite off the deep end in recent decades). So Galli is coming from that interesting, multifarious and confusing world of Anglican traditions (note well the plural). So the best that good works can offer—and of course asceticism was very much on Luther’s mind as a “good work,” seeing he was an Augustinian monk—is the same that the Mosaic Law can offer. It is a tutor to show you what a rotten sinner you are. That’s absolutely what Paul says about the Mosaic Law, but he doesn’t say it about asceticism. Instead, the whole New Testament actually speaks quite highly of asceticism and its place in making the will receptive to grace. But never mind that. So what we really have here in Galli’s article is essentially a less Pietistic sector of the Reformation criticizing a more Pietistic one. For Orthodox Christians, Lent and all of our ascetical effort (which includes fasting around half the days of the year, not just Lent, as well as other ascetical practices, none of which include picking something to give up) are about neither the Pietistic emphasis on self-discipline and individual piety and belief nor in the more Lutheran concern of revealing us to be sinners (thus representing the continuum between the Radical and Magisterial Reformations, respectively). There is nothing wrong with either goal, of course, but that is not the point of asceticism. And I have to say that asceticism is rather a silly method of showing yourself to be a sinner. Wouldn’t it be easier just to take a long, hard look at yourself? And what about the Pharisees who “succeed” in their asceticism? It would seem to have the opposite effect on them. Centuries upon centuries of Christian tradition is finally about “play acting”? Yeah, that does sound pretty “miserable” and “onerous” to me, but that’s because you’re doing it wrong. It actually doesn’t particularly matter if we succeed in “self-improvement” by means of asceticism. If we do, great, but if not, what we are actually trying to achieve is something different. It is becoming more receptive to the free gift of divine grace, so that we can become by grace what Christ is by nature, so that we can be united to God in His energies, becoming partakers of the divine nature. It also doesn’t matter if we reveal ourselves to be sinners or not in practicing asceticism. To be honest, if you’re not aware that you’re a sinner simply by being in the presence of the beauty and glory of Orthodox Christian worship, then I’m not sure what will reveal it to you. But I suppose if you belong to a religion that does not know about that beauty, it may well take something else to reveal this to you, because you’re cut off from the true revelation of that glory. Because he is probably far from experiencing the amazingly heartrending beauty that we Orthodox experience in Lent, I can see why someone like Galli might find Lent to be “a miserable way to live” and why he’d never want to “turn Lent into a lifestyle.” But if you’re Orthodox, Lent is very much “a lifestyle”! We’re always in the process of struggling against the passions of our will, and asceticism is our constant companion—Lent is only one season in which it is intensified. And if we do it the right way—as part of the Orthodox Christian community—it is rather far from being a miserable life. Indeed, the true ascetics always have a curiously indomitable joy. For the Orthodox, Great Lent’s purpose is possible and revealed only within the actual community of faith, both within space (including all those currently in the Church) and time (including all those who have come before). It is not an individual “achievement.” It is something that is done within the Eucharistic, liturgical community, which is why Great Lent so radically transforms our daily liturgical life. It is also perhaps why so many people who may not otherwise make confession a frequent practice often find it within themselves to come to confession during the Lenten springtime (and “spring” is what Lent actually means, by the way)—they feel something awakening, and they know that the only possibility for its coming to full alertness is to reconcile and renew with the community with the guidance of their father-confessor. What is missing both from the Pietism that Galli criticizes and the Reformation opposition between faith and works that he endorses is the doctrine of theosis, which is communion with the Holy Trinity. That communion between us men and women and the Divine Community Himself (for He is three Persons!) is what drives our asceticism and is the inner meaning of Great Lent. For a great deal more on what asceticism actually means and how it’s everywhere in the New Testament, contra what the Reformation says about such things, I very much recommend a piece by Fr. Georges Florovsky linked above, The Ascetic Ideal and the New Testament: Reflections on the Critique of the Theology of the Reformation. In English, at least, you can hardly do any better. All of this is, of course, driven by monergistic concerns: your human will can in no way contribute anything to your salvation. Calvin even goes as far as to state that Christ’s human will contributes nothing to our salvation! Thus, Lent can only reveal that we can do nothing and God must do everything. Thus, at the root of this are different Christologies. Our notion of theosis is heavily dependent upon the synergy of the two wills in Christ. Thank you for posting this article again, Father Andrew. 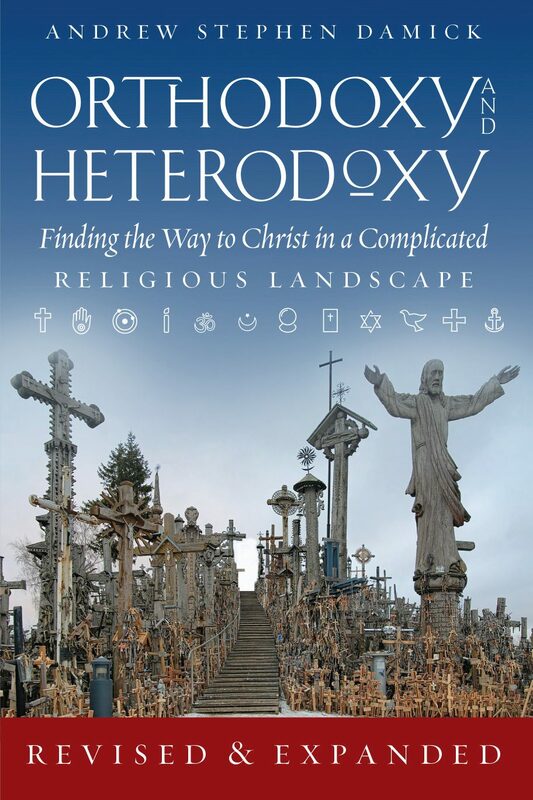 It is an excellent reminder of the great divide between Orthodoxy and Evangelicalism – and Protestantism in general. Herein lies the conundrum for me. How does one consider works to be of no importance with regard to their salvation and yet believe that the truly regenerate will do good works thereby revealing them to be genuine Believers? The same way they view baptism as important for salvation and yet nonetheless merely an outward sign of an inward grace. Calvinism is a complete philosophical system and hermeneutic. The problem is that it is the wrong philosophical system and hermeneutic. I came across this essay while searching for Mark Galli’s original article. I thank God for your thoughtful challenge to my own tradition, which gladly embraces the label “Pietist.” Your case against the individualism of pietistic evangelicalism and Reformation theology in general is well made. In general, I agree with most of what you say. I would simply like to offer the possibility that there may be those among the “pietists” who have a clearer understanding of the community of the Church and its relationship to the divine life of the Trinity. I would also like to suggest that some of the earliest voices in German pietism had some inkling of this communal, churchly orientation rather than a concept of sheer individualistic piety and holiness. I am a minister in the Evangelical Covenant Church. I regularly partner in teaching a theology class to our new pastors during which I present a more Orthodox view of the Trinity and argue that the aim of human life is to join in the life of the Trinity. In general, though we do talk much about new birth and new life in Christ, our denomination’s theology insists on looking at that spirtual life as corporate rather than individual. Moreover, though there is certainly much individualism to be concerned about in the Reformers and early German pietists, one need only look to the seminal pietist work of Philip Jacob Spener, Pia Desideria, “Holy Desires,” to find a call for holiness that is aimed more at the reform and well-being of the Church as a community, rather than at individual piety. So I accept the critique. It’s needed. I merely want to say that there are some of us among the pietists who are with you in spirit and who pray and work toward a more communal and Trinity oriented church life. We are not separatists. Our denomination’s founding verse is Psalm 119:63, “I am a companion of all who fear you,” reflecting our sense of unity with all Christians, including Catholic and Orthodox. You may believe that the only way forward in that direction is to uproot and join with you in Orthodoxy, but we believe we are planted by God in a Christian community and that our calling is to labor where our Lord has placed us and seek that greater unity which He intended for His Church. God bless you and give you and your own community a good and joyful Lent in intimate communion with the Holy Trinity. Your response is very thoughtful and irenic. I agree, there are some much better strains within Peitism. Otterbein, for instance, is to be commended for his communal view and his insistence on confession before communion. Nonetheless, we must confess that we desire more than just a mere “sense of unity” but actual sacramental unity. The latter is clearly what Christ desires. Is it not a great sin to neglect the will of God? I nearly always find myself in agreement with what I read on this blog. The same is true, in large part, for this post. However, I think it worthwhile to point out that picking a Lenten discipline — in addition to the ecclesial disciplines of fasting and abstinence — long predates the advent of Pietism and actually has roots in the indisputably Orthodox “Rule” of St Benedict (c. 542 A.D.). In this sense, while it may not be part of the Byzantine tradition, it does have a basis in the Latin tradition, long before the estrangement of the West from the communion of the Orthodox Church. It does, therefore, have a proper “place” in Western Orthodox practice (as found in two of the canonical Orthodox jurisdictions in North America).